Here's my entry in the Classic Movie Blog Association's spring blogathon, The Fabulous Films of the 30s. 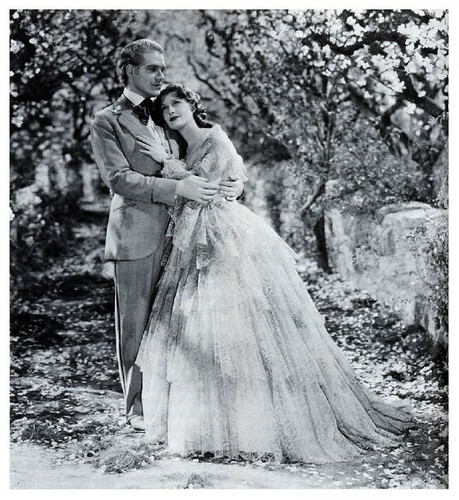 My article is about the classic musical Maytime, starring Nelson Eddy and Jeanette MacDonald. Jeanette MacDonald and Nelson Eddy were superstars in the 1930s. Their legions of fans flocked to movie houses to see the screen duo warble classics like “Ah! Sweet Mystery of Life” and to sigh over Eddy’s wholesome good looks and MacDonald’s elaborate costumes. MacDonald and Eddy made eight highly successful films together between 1935 and 1942. Eddy and MacDonald still have many devoted fans, but they aren’t as widely remembered or appreciated today as other thirties musical teams like Fred Astaire and Ginger Rogers. This is partly because the duo’s films were operettas, a style of musical theater that you don’t hear of much these days (If you’re not familiar with operetta: When it’s good, it’s The Wizard of Oz. When it’s bad, it’s the songs you endure in Marx Brothers movies while waiting for Groucho to make another wisecrack). Also, although MacDonald and Eddy were both spectacular singers, they were often saddled with schmaltzy storylines that didn’t suit either one of their talents. Eddy was only really ever a competent actor and MacDonald was best in light comedies, like the series of films she made with Maurice Chevalier in the early 1930s (A Person in the Dark will have a review of one of MacDonald and Chevalier's best films, Love Me Tonight (1932) on April 29). Still, their films are entertaining and charming. Who can resist the “Indian Love Call” from Rose Marie (1936) or Eddy belting out “Stout-Hearted Men” in New Moon (1940). Jeanette MacDonald in one of the elaborate costumes designed for her by Adrian for Maytime (1937). MacDonald and Eddy made one film that deserves to be remembered as a classic. Maytime (1937) was the duo’s third film and while there’s plenty of schmaltz, the film is also a compelling melodrama that director Robert Z. Leonard handles with elegant understatement. Maytime benefits from a stellar supporting turn by the great John Barrymore, but MacDonald also gives a nuanced performance in a part where she has to age from a teenage girl to an elderly woman. A Spanish language poster for Maytime (1937). Maytime tells the life story of soprano Marcia Mornay (MacDonald) in a series of flashbacks. Mornay is a promising young singer at the Paris Opera when she comes under the control of theatrical impresario Nikolai Nazaroff (Barrymore), who begins to take over every aspect of the Mornay’s life. Soon Mornay is an acclaimed singer and Nazaroff proposes marriage, but Mornay balks when she falls in love with a penniless voice student, Paul Allison (Eddy). The film follows their star-crossed love story as Mornay tries to rid herself of Nazaroff’s almost mesmeric hold over her mind. 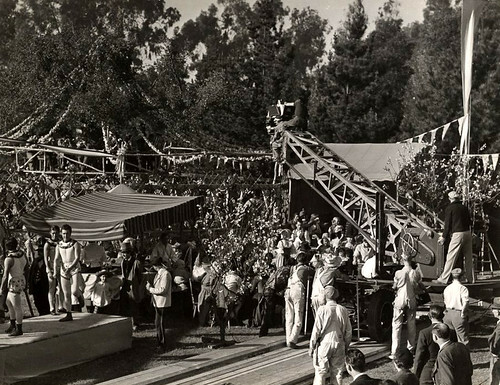 A behind the scenes photo of the Mayday fair in Maytime (1937). MacDonald always said Maytime was her favorite of her own films, and she gave Leonard a great deal of credit for its success. His loose directing style helped both MacDonald and Eddy feel comfortable in their roles, and it shows in their performances. “He didn’t believe in the iron-handed technique,” MacDonald said in an interview quoted on TCM’s website. “Mr. Leonard always kept us pliable and spontaneous.” MacDonald and Eddy actually do seem like they’re having fun together, especially in the scene where they duet to “Carry Me Back to Old Virginny.” They actually sing some of this song in normal voices rather than the bombastic belting that was so popular in thirties operettas. Leonard's light touch especially suited Eddy who seems to be having a great time while singing about Virginia ham and eggs . Even with Leonard’s deft direction, Maytime probably would have fallen apart without the considerable talents of Barrymore. He gives an understated performance, or at least an understated performance for Barrymore (minimalism wasn’t really his thing), and MacDonald responds beautifully. Mornay is both attracted and repelled by Nazaroff and so is the audience. I clearly remember the first time I saw Maytime as a child (it used to air regularly on the local PBS station). Barrymore terrified me so badly I couldn’t sleep that night. The only other film performance that scared me so much was Margaret Hamilton as the Wicked Witch of the West in The Wizard of Oz. A vintage poster for Maytime (1937). Maytime is first and foremost a musical and both MacDonald and Eddy get their own showstopping numbers. Eddy’s character is introduced while he is singing a humorous pastiche number that takes snatches from The Barber of Seville, Rigoletto, and the William Tell Overture. MacDonald had many spectacular moments while portraying an international opera star. She expertly sings arias from La Traviata, Norma, and Lucia di Lammermoor throughout the film. However, the highlight for many MacDonald and Eddy fans is the beautiful love song, “Will You Remember?” It is probably their best on screen moment, especially when it is repeated in the sentimental climax of the film. Maytime is based on a 1912 operetta by Sigmund Romberg, although the only things left from the original are the title and “Will You Remember ?” MGM Producer Irving Thalberg purchased the rights for Grace Moore, then MGM’s leading operetta star, but when Moore decamped to Columbia he transferred the production to MacDonald and Eddy, who already had two smash hits under their belt. Thalberg planned a lavish Technicolor production, and filming actually began in August 1936, but that production was scrapped when Thalberg died in September. Filming re-started on Oct. 29, but by that time Maytime was a much different movie. The expensive Technicolor cameras were replaced by more cost effective black and white, and much of the supporting cast were unavailable because they had moved to other projects. The original script was thrown out in favor of a new version that screenwriter Noel Langley wrote in just three days. This is probably just as well because the stage version of Maytime was about a girl who falls in love with a gardener, which isn’t as ripe with dramatic possibilities as an international opera singer who is controlled by her Svengali-like manager. In fact, Langley may have borrowed large chunks of the plot, including the flashback format, from Noel Coward’s 1929 operetta, Bitter Sweet, which concerns a brilliant singer who carries a decades long torch for a penniless music teacher. Ironically, MacDonald and Eddy would film Bitter Sweet in 1940, although it wasn’t one of their more successful films. Vintage sheet music for "Will You Remember?" from Maytime (1937). 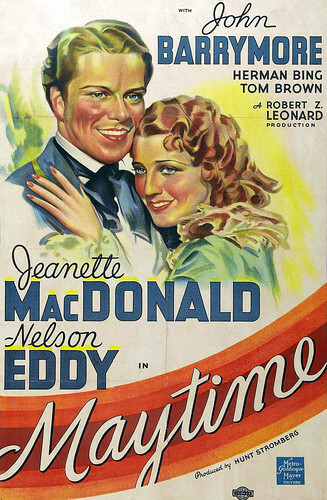 Maytime was another huge hit for MacDonald and Eddy, and they went on to appear in five more films until Eddy left MGM for Universal Pictures in 1942. They continued to perform in concerts together until MacDonald passed away in 1965. Maytime is available on DVD and video on demand. Go here, for the other entries in The Fabulous Films of the Thirties. Lovely post. I used to really have a negative reaction to Jeanette (especially with Nelson), but I have come to really appreciate what a great star she was. I saw this film before the appreciation started and agree that Barrymore is wonderful here - a real actor and not a caricature. Since I feel for her in "Love Me Tonight" I have been wending my way though her films and now have to circle back to this classic. Thank you for an insightful post. One of my former neighbors used to have scrapbooks full of Eddy and MacDonald. She was a young woman in the thirties and they were her favorites. I never realized what great stars they were until I looked through her books. They just don't translate in the 21st century. I think Maytime is the best film for modern audiences to understand their appeal. Can't say any of the MacDonald/Eddy operettas I've seen have clicked for me, but I'll keep an eye out for this one. None of their films are Citizen Kane, but this is the best one by a mile. It's really a shame Maytime wasn't made in Technicolor because Adrian really outdid himself with her gowns. They are spectacular! I adore anything and everything with Nelson and Jeanette, particularly the humour in "Sweethearts", but there is truly something magical about "Maytime". When I was a kid my least favourite part of the movie was the finale "Czaritza", but now I look forward to it. I seem to recall reading somewhere that "Maytime", along with "The Good Earth" were the biggest box office successes of 1937. True quality. The Czaritsa number terrified me as a child ( I was an impressionable youth). Seeing it as an adult, I appreciated how every aspect of the number is superbly crafted from the lighting to the staging to the costumes (MacDonald's headdress is to die for) and what truly superb singers both Jeanette and Nelson were. In every aspect, this was an A-list film for the decade's top-grossing film stars. Adrian was MGM's dress designer par excellence, and made Jeanette's gowns for her films. His insistence on excellence extended to the use of diamonds--real diamonds--in both her headpiece and on her gowns. If you look closely at her Empress outfit when she is singing "Tsaritsa", you can see them all over the headdress and down the front of the sable-trimmed jacket. Adrian said that nothing else looked like a diamond under the lights--everything else looked fake--thus it lends a subliminal credulity to the character; an unquestioned authenticity. This idiosyncrasy created a new job at Metro: the diamond mistress. Where they had only had a wardrobe mistress before, they now had one person in charge of the gowns that were set with diamonds. She had to count the diamonds as they went in and out from her care to make sure no one removed any. You can also see diamonds in some of Jeanette's gowns in "The Firefly", notably the black Empire one in which she captivates de Rougemont. This was truly an A-list film for the decade's two, top-grossing stars. Metro was the top studio and had a budget that no other studio could match. Imagine having the music department create an opera out of Tchaikovsky's 5th Symphony. And Adrian was their top dress designer. He insisted on using real diamonds for her headpiece and down the front of her sable-trimmed jacket in the "Czaritza" sequence. He said nothing else looked like a diamond; everything else looked fake. If you look closely at the headpiece you can see them. He also did this for her black, Empire-waisted gown in "The Firely". It lends a subliminal air of authenticity, so that they seem to be the character they are playing. This penchant for diamonds on the gowns led to the creation of a new job at Metro: the diamond mistress. Where they had always had a wardrobe mistress, they now had a woman in charge of the gowns with the diamonds sewn on them. It was her job to count the stones and make sure that they were all there, when the dresses were checked in and out. Great review Amanda. Its amazing comparing how wildly popular Jeanette and Nelson used to be compared to now - and of course that style of "Operetta" is partly the reason. I must say I liked her in all her movies, more than I liked his roles separated from her. Thanks for covering this classic. Thanks for reading and your kind comments. I really love Maytime and I wanted to include it in the blogathon, since MacDonald and Eddy were two of the decades biggest stars. I really enjoy films with that kind of Svengali part (Red Shoes is a favorite), and it would be nice to see a character like that in a more lighthearted film! Barrymore seems like a great choice. Barrymore made a movie called Svengali in the early 30s, although I remember very little about it except that he was dressed up like Rasputin and he played a music instructor just like in Maytime. I remember a delightful comic performance by MacDonald in THREE DARING DAUGHTERS, where she simply gets to act most of the time, sing occasionally and be glamorous all of the time. It's probably my favorite of her roles. I must see MAYTIME; thanks for the recommendation. I've always thought that Jeanette MacDonald was a really great natural comedienne. Great review! It's fascinating how these operettas used to be so popular but then fell out of favor. Thanks for focusing our attention on this beloved duo. They don't get enough spotlight these days. I didn't realize this film was originally intended to be a Technicolor extravaganza produced by Thalberg! Interesting to think how it might have turned out if he hadn't passed away! 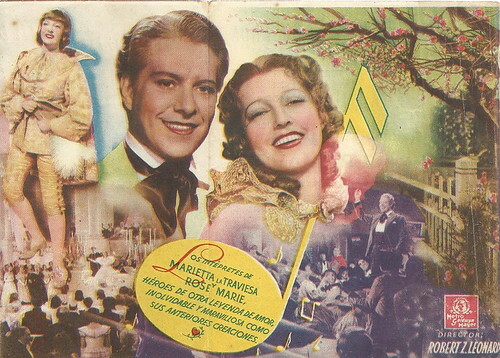 This was one of Romberg's colossal hits on stage, and it's a shame it couldn't have been transferred to the screen more or less intact, but Nelson Eddy and Jeannette McDonald were such a unique team that it was inevitable material would be tailored to them and the prevailing box office tastes. Always fun to watch. Great post, thanks. Until I did research for this article, I thought Maytime was an original screenplay because of all the songs they took from other sources. "Will You Remember?" is certainly a beautiful song -- I think even those who don't like opera or operetta can appreciate it -- so it's a shame that more of the original score wasn't used. Okay, maybe their films did have "schmaltzy storylines" but I sure love them. I'm glad you chose to spotlight this dynamic duo, because they are too often overlooked. In fact, I like them so much, your post inspires me to watch one of their films tonight! Personally, I love Maytime because it is "schmaltzy" in a good way. That's what makes it so endearing. I think sometimes modern audiences favor the super-serious Criterion Collection fare when it comes to older films, and they miss out on some really great movies that bring such joy to many people. Not everything has to be Citizen Kane. I'm completely in love with Jeanette...sigh. She's in a trio with Carole Lombard and Deborah Kerr as my fave leading ladies...amazingly talented and beautiful.